It’s interesting how some things seem to come all at once. Lately we have received a number of comments and emails from people who appear to be focusing on the same thing. It just prompted me to write this post because I think it is something that a lot of people are getting caught up in and I really feel that it can be detrimental to anyone trying to make money online. What I am talking about is the tendency to over-think things in relation to your online business. For instance, one of the more common questions we see is from people wanting to know our traffic numbers in relation to CTR’s, but you know what?…we really have no idea what that is. Another question we get is what is the percentage of keywords that you have in the number 1 spot in Google….again we have no idea. We know that we have some in the number 1 spot but we don’t sit here analyzing every keyword we are ranking for to see where it’s placed. Whew, that’s tough work, but I know where these people are coming from, because we used to do the exact same thing. Just to illustrate this with an example, I had a spreadsheet where I would enter every keyword we wanted to rank for in Google and would check just about every day to see if our ranking had changed. (Comment from Wanda: LOL, lets be honest here, she would check it hourly). I would also spend a lot of time in Google Analytics analyzing this and that and checking keywords and rankings. I’d create spreadsheets with hundreds of keywords and how many searches they got and what the competition was like. What a waste! Now don’t get me wrong, Google Analytics is an amazing tool and we use it to this day but we don’t sit here spending hours analyzing and pouring over stats and data. And we spend even less time on keyword research. And we really don’t even bother too much with meta tags and meta descriptions – we let WordPress do that for us. Now you might be thinking that we can afford to forget all of this stuff since we are making a healthy income online and don’t need to worry about it. But I can tell you now that we gave up on all of this stuff long before we started making the big dollars. It didn’t just hit us in the face either – we didn’t just come to the conclusion one day that we needed to stop focusing on the detail. It was more of a progressive thing. I think it was more of a conscious decision that we needed to provide value more than anything else. And once we had made that decision, it no longer seemed relevant to spend all our time concentrating on all of the analytical detail – so over time we no longer focused heavily on keyword research or meta tags or keyword density or anything like that. Our focus changed to the point where we were only thinking about what value we could provide to our readers rather than how we could tweak a page so that Google would rank us highly for it. When we were over-thinking, things didn’t work as well as when we stopped doing that and focused on the content and the value we could provide. A good example of this is this blog. I am astounded sometimes at the popularity of it – why is it that it does so well because we don’t do any keyword research for this blog, we don’t go out and actively get backlinks for it (we started to but quickly gave up to work on other things), we don’t promote it, we don’t analyze metatags or do any SEO and yet the traffic increases. We have even installed the SEOPressor plugin on this blog (which is pretty cool by the way) but I think we’ve only used it once on a page and haven’t bothered since then only because we just don’t feel the need to get the keyword density just right. This blog is simply for our enjoyment and through it we are able to share the strategies that we have learned for making money online. It’s interesting how this works – we haven’t done any of the things that SEO experts say we should, and yet this blog does very well. We don’t do any keyword research and yet we rank for all sorts of things.We don’t have the perfect keyword in our domain name and we don’t spend hours analyzing CTR’s or other data to see how we can improve. So what is it about this blog that makes all the difference? I’d like to think it’s because we provide value. What’s your opinion? I’ve seen two other examples of this. The first was by a gentleman on a forum who wrote about his wife. She had a few websites that were doing really well in terms of traffic. One day he decided to add some Google Adsense to one site without telling her. That day she made something like $300 (can’t remember the exact amount). He was astounded as it was more than he ever made with his websites. She knew nothing about SEO and just developed her websites for the enjoyment of it. She was completely against adding any ads and he reluctantly had to remove them. The second example came just recently from an email we received from a lady who had a friend who knew nothing about SEO or keywords or anything like that but was so successful with her website that she was now working at home full-time. The lady who emailed us wasn’t having as much success but she was smart enough to realize the difference between her and her friend and the need to change her focus. I think what we are getting at here is to stop trying so hard. 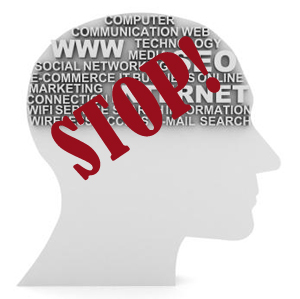 Stop over thinking things to the point where you are only interested in ranking in the number 1 spot in Google and nothing else. Start enjoying what you do instead of seeing it as all hard work and simply a race to get to number 1 for your chosen keywords so you can make some money. Keyword research, SEO, analytics and so on all have their place but they shouldn’t be your main focus. Try changing your focus to providing value first and see what changes it brings to you. You are right in that your blog receives traffic because it provides value. I have a site that I made about my favourite tourist destination (that I built way before I ever knew about I.M.) and it gained traffic over time simply because there was regular content and the domain was a couple of years old. As far as the internet marketing arena goes, you are always going to attract readers if you are having even a small amount of success. People see that you are making a good living online and naturally want to replicate that. In my opinion you can then get into a perpetual cycle where more visitors to your blog increases comments and pageviews which increases the sites value in the eyes of Google and hence you are ranked for more terms which in turn brings more visitors (and so on). Interestingly many people have become rich by simply blogging about stuff they were passionate about (without then intention of monetisation) but who then had their eyes opened to the possibilities of making some sort of income from them. The Australian guy who owns a highly popular car blog comes to mind. I think this blog is also good at retaining people because you provide valuable content and I know that whenever I see a new blog post come up in my email I’ll drop everything else to read it. It’s one thing to provide unique content but it also has to be engaging and valuable enough for the person to want to give up their time to consume it. I agree with all of that Ben. There is some truth in that people will come here because they can see that we have had some form of success from all of this. But they won’t stay unless they see continued value of some sort. And we have a lot of repeat readers so something must be working right. I think you are encouraging us to shift what we focus on – after all, “What you focus on you get”. If we focus on tech details we will notice even more trivia to spend time on, thus ignoring our customers. So I think you are telling us to serve our readers and the other stuff will take care of itself. When we start in I.M. we just write for the hell of it and mostly we get solidly ignored and with little to no traffic either fade away or realise that we need to do some market research and find out what people want to read about and find out how to get in front of these folks. I’ve done the whole “write with passion and the readers will come” malarky – most newbies do this before they fall into the round of buying crap product after product. Well the junk stuff keeps coming and the “secrets” remain unrevealed! I think the key is that if people remain online long enough they fall into working in a way that fits their skills. And when you do that you find success. And it’s funny how things turn out. I love research and writing – so I should be creating info products, right? Tried it – hate it! What totally suits me and my powers of analysis and my desire to help is writing reviews of taangible or physical products. I was almost born for it – but it’s the last model I tried – and I can hardly believe it took me so long to find it. How about “write with passion” 80% and market research/SEO 20%? Don’t get me wrong Alex. I never said to totally give up on SEO etc, just to not focus on it so heavily. So your last line is perfect really – focus on writing with passion 80% and research/SEO 20%. Unfortunately usually it’s the other way around. Yes, I totally agree and I’m not going overboard with stats. It’s too overwhelming anyway. I’m just going to provide value and build links. To me there is a major difference between a blog like this and a product review blog. I guess I separate them in my mind. This type of blog is personal while the other types of blogs are more formal. This type of blog is viral whereas the product type of blog needs a constant supply of backlinks to get traffic from the search engines. You are absolutely spot on with that assessment of the different types of blogs Lisa. They are very different but the one common factor to both is ‘value’. If you provide value as a priority then you can’t help but succeed in my opinion. First of all and it will be my favorite two word for this blog is : Great Post! I just have one question, if you don’t really think about keyword research, SEO, or another technical analytic, then what is you really doing to promote and bring traffic to your amazon website? We still do keyword research, SEO and so on but it isn’t our primary focus. Now our primary focus is on providing value and the SEO etc comes in second to that. Our main method of bringing traffic to our websites is by ranking highly in Google – so we focus on natural search. And our main method for doing that is via guest articles – not on article directories but on regular blogs and websites. It results in very strong backlinks. but the problem it, I’m not a person that come from country that using English as primary language. I’m so bad in grammar, you might be realize when I wrote comment for this article. I’m little bit scary that person will reject my guest post.would you like give suggestion to solve this one? 1. Asking someone on an outsourcing site like Fiverr.com or Elance.com to edit your articles. That is going to cost you of course. 2. If you are limited on funds then do you have a service you could provide? For instance, could you tidy up someones WordPress blog or create graphics, headers or install a theme for someone in exchange for them editing your articles. A great and timely post. It’s interesting that I only read 2 blogs and the other one is also by a man who has become very successful recently after many setbacks. He was saying how instead of worrying about what Google does and the myriad other things people get caught up in, just write more good content. He writes 5 days a week but one day he shuts down all of his other windows(email, forums, blogs, etc.) and just writes content until his hands say no more. One day with absolutely no distractions or shiny things. When a site drops in rank, just write more content. I truly believe that good content is king. Your comments about the successful lady that probably doesn’t know what SEO stands for just backs that up. Thanks for another truly thoughtful and well written post. I believe ‘good content is king’ as well Jerry. Unfortunately the content part is usually the last thing people think about when writing for review sites. The goal with most people (and we were the same) is to just get the reader to Amazon or whoever else the merchant might be. So this usually results in short reviews with little or no substance to speak of. This is definitely going to be my motto this year. I spent so much time last year thinking about ‘doing’ versious things, thinking doesn’t make me money. That’s right Dean – if all you do is think and don’t take action on it then that can definitely be a waste. Thinking can be a great thing but when we over-think things we tend to find excuses for not even getting started. “When we were over-thinking, things didn’t work as well … ” It’s a 200% correct story. Additionally when you filled with lots of info ( theory & techniques), a person might feel “lost”, this is what was happened to me also. This very nice post. Thanks. That tends to happen a lot with newbies. They research and research but end up with information overload and they don’t know which way to turn. Everybody is telling them a different way to do things and in the end they don’t even get started. thanks for the post, i can just agree. You’ve actually done it all the right way Monja…your primary focus to begin with was to provide value and that’s what brought in the traffic. Now you can take the time to play around with SEO to improve on the success you already have. Thank you for the reminder. In short: Just Do It! I’ve been very guilty of over-thinking and it seems like I have plenty of company. We seem to be so paranoid that it won’t be ‘perfect’ the first time out. But you stress this in your course: Get something on the page and tweak as time goes on. I think many of us (certainly me!) ‘tweak’ as we’re creating but often never get out of the tweaking stage. You don’t a lot done using that method. So thanks for the reminder – and for the kick in the pants! I know exactly what you mean by tweaking. I think we spent the first few years of our online business tweaking. I love building websites and playing around with them so that was my downfall in the beginning. I spent too much time on building and tweaking and not enough on writing good content and backlinking. I was way more successful in 2009 and early 2010 when I accidentally stumbled onto success with a few sites, then I am now – where supposedly I know a lot more about IM and SEO. I wish I could go back to when I was dumb and had success versus now where I am smart and am finding less success. Perhaps I am over thinking it all way too much. I don’t look at my stats hourly or anything like that, but I do basic keyword research. Maybe I should go back to winging it. lol. Keyword research is okay Missy. It helps to know if a product is going to generate enough traffic for you before you write a review for it. So doing ‘basic’ keyword research is a good thing but you don’t want to be spending hours on it. You are bang on ladies. I used to spend hours every day reading the warrior forum and finding just the ‘right’ people to follow. Now I just spend time on my sites. I do want to add that you are an inspiration to me. After reading a post of your in late November or early December I went to a site I have had for about 18 months, get reasonable traffic, but insignificant sales – ruthsshop.com I can’t even remember what i was you had said but, I spent about 2 hours downloading youtube videos on grills, plus added some BBQ recipe videos. THE VERY NEXT DAY I had two sales. I ended December with 11 sales, more than I have had in 9 months. I still need to go and rewrite reviews to follow your format…..and I know too, that will make a huge difference. It’s so nice to hear that we have helped Ruth and a big congrats on your sales. We’ve heard from a lot of people lately who have simply reworked their reviews and have started making sales. The funny thing is that my first website, according to Google’s own Keyword Tool (after they updated their estimates for traffic late 2010) stinks in traffic estimates. I still made about $4000 from it in November and December. It has 7 content pages. All my main terms are under 1000 a month. You know what? It shouldn’t work according to the numbers. Indeed, I call this analysis paralysis. :) Just get to work and produce something. Exactly Amy! We can easily stall when we over-think things. Love that phrase Amy, it just sums it up beautifully. “Analysis Paralysis” classic. Google themselves has said more then once…..STOP and WRITE. Google is right when they say ‘stop and write’. I am waiting for the day when they can distinguish a good article from a bad one. When that day comes we will definitely be able to give up SEO and backlinking and all of that stuff for good. I’d say the beginning to all that was giving up on meta KW’s. Guilty as charged. I tend to look at my stats far too often but then again some of the gurus point you in the direction of 60% research, 20% writing the content, and 20% getting backlinks. Then you spend time to see if all those green squares in Market Samurai allowed you to get your site in the top 10 in Google. Speaking of backlinks, do you gals go out of your way to get backlinks? Ok… reminding myself that I should read APP again to see if you answer the question there. That illustrates one of the biggest problems with trying to make money online…everyone has their own theory on how to do it – even the gurus have different opinions to each other. It makes it extremely confusing for newbies and even those that have been around a long time. And yes we do go into backlinking in the Amazonian Profit Plan. Can’t remember the page it starts at but it is somewhere closer to the end of the book. Another great post, ladies, with a point that cannot be emphasized enough! I have been in the business for several years, and like another mentioned, spent a lot of time reading various forums, and trying this method or that one. But, it wasn’t until I actually started taking action – right or wrong – that I started seeing results. Now, while I look at some stats daily, others weekly, and even monthly on others, it’s not the primary focus of my business either. And, as far as SEO, like you, I rely on free traffic, but I get that traffic strictly by posting good content and doing a little backlinking. Funny thing is – if you work on the content, other sites will naturally start linking to your sites! That’s so true Tammie. If you provide good content to begin with it is so much easier to get backlinks without even trying. Looking for perfection, or, not wanting to ‘screw up’ is one of the reasons why I spend too much time analyzing and getting myself WAY too bogged down with the details. I really have to force myself to take a step back and look at everything from a higher point of view. When you worry about every little detail it slows you way down. Being a bit of a perfectionist can be a good thing but as you say it can also get you bogged down in the detail. But at least you can see it in yourself so that is good thing Chris. It all comes down to – stop focusing on the money (as hard as that is) and focus instead on providing service. The more you give, the more you get in return. It’s not an easy lesson, especially when things are tight, but I’m finding I’m changing my focus naturally in my effort to bring more balance into my life and my business. I was totally obsessed for quite some time on the numbers etc. Wise words from you girls as usual. Thanks. Yes it is hard to stop focusing on the money especially when you don’t have any. It’s kind of a catch 22 in that sense. The more you think about a lack of money the less you will get. Really great post, I have to admit that although I do pretty well at affiliate marketing that I am on the SEO merry go round and it takes a lot of effort to keep up with the competition and Google. I am seriously considering going down the road you outlined of providing value rather than pleasing the search engines. Well you are in the best position to give it a try since you are already doing well. Many are still trying to make things work and they are a little hesitant to change their strategy. Sometime, I think paralysis by analysis is more detrimental to success than worst than procrastination. I know of a lot of people who never even get started because of procrastination. Again it comes down to over-thinking things – the more and more thinking you do, the less likely you are going to get anything done. Nice post. A timely wake up call for those who analyze too much and want to be a perfectionist. Keyword research, SEO, and landing on the 1st spot in Google is useless if you don’t know how to convert that traffic. Providing value to other people, as you say, is THE way to earn a long term income. Exactly Welly. There are a lot of people who get some decent traffic but they have very few sales to show for it. Great post! The topic of SEO always garners quite a bit of attention, however, I agree that the focus should be on the content and content structure. If your plan is to refer or sell product, the post and post title should be crafted so people can find while searching. It is extremely difficult to promote products if you randomly drop affiliate products into a post about your walk in the snow. Crafting product specific posts will drive traffic as long as you have some basic SEO and keyword knowledge. This type of information is readily available online. While there are plenty of plugins and widgets to aid you, my best advice is research people who successful selling online. Go to school on how their posts are constructed and arm yourself with a general understanding of SEO methods. One last suggestion for Amazon affiliates..don’t rely on their widgets or banners for big returns. Text links within your posts are your best bet. Text links definitely work better than widgets or banners. We’ve tried pretty much everything and always come back to text links. Thanks for this post Paula and Wanda. I used to spend way too much time trying to find out where my keywords stood and then worry when they dropped back – now I rarely do that. One thing that I have to watch is spending too much time going through forums. There always seems to be a number of interesting posts but a couple of hours can go by without getting anything achieved if your not careful. I’m continuing to focus on writing and adding content to my website and I keep hoping that it will eventually pay off. Forums can be a great source of information but they can also sidetrack you in a big way. This is particularly so with Internet marketing forums because everyone seems to come in and give their two cents on how their method works. So its easy to get caught up in it all. I know that forums can easily take up my time so I rarely go into them now. Great post – I have been thinking of starting a blog, but I have been spending a ton of time trying to find the perfect thing to blog about – your post is inspiring me to just get started! Thanks! Getting started can often be the hardest part. It’s usually a fear of making a mistake, but a mistake is just a learning experience and we all need those to suceed in any business. Thank you again for sharing your thoughts and wisdom. I, by nature, am a statistical thinking kind of person. I do not spend much time on them, but I do tend to look from time to time. What can I say, I love numbers. However, I do enjoy listening to your calm, no worry approach, while doing what it is that you so obviously enjoy doing. We still look from time to time as well Mike. There’s nothing wrong with that. You still need to keep track of where things are at, but you just don’t want it to encompass your whole online business. Money is the main motive behind running a business and every one want to earn money more and more by their business. At all the movement that have a curiosity to get more and more from their business. Granted Vaastu, anyone running a business wants to make money. But it should not be the prime motivator, it is very important to add value to a service or product that benefits the buyer. That is why it is important to write helpful and informative reviews. We focus more on helping our readers and concentrating on the freedom that this business gives us rather that only thinking about the money aspect. Of course we like the money but we also need to enjoy what we are doing. Since purchasing your book, my wife and I have been revamping our approach to this business. In both December and November, we made over $1000. That’s been very motivating. And we’re enjoying creating content that offer value. We’re focusing on backlinks now. We’re having difficulty finding strong opportunities to submit articles. When we do a search (submit articles, write for us, etc.) on Google, we find several pages of article directories. How do we refine our searches? That’s great to hear about your sales for November and December Grant and good to see that you are focusing on backlinks. Searching for sites to submit articles to can be time consuming. Try using the keyword plus the word “articles” eg. dog articles, home improvement articles and so on. You are less likely to find article directories when you do that. When you start using the words “submit” or “add” then you are more likely to find article directories but you still need to do that because there can be some gems hidden away within those search results. Just remember when you are doing all of this that is is quality you are after not quantity. One good quality backlink can be worth more than 100 poor quality ones so it is all worth the effort in the long run. I’ve been reading a lot lately on internet marketing forums about guys asking how they can index their backlinks and how why they can’t see their backlinks. The common response to guys who have been members on the forum for a couple of years is to forget about your backlinks and just focus on building new ones. I think it is really easy to over think everything, when in reality the best plan is to just stick to the original goal and do something to build on it everyday. I think a lot of people focus on things that they can’t really control instead of the things they can. You really can’t control whether your backlinks are going to be indexed or when. You can do things that can help them along but really you are better off focusing on things you can control like writing quality articles for instance. I have a little personal blog which I enjoy, however, I just read that Colorado residents can’t use Amazon Marketing. Was really getting interested in learning I.M., until I read that! Any advice for Colorado residents?? A lot of residents from states that have been excluded from promoting Amazon products have created companies in other states like Nevada for instance. But you don’t need to promote Amazon products in order to make money online. There are a lot of other networks you can deal with like cj.com and linkshare.com for instance. And also clickbank.com if you want to promote digital downloadable products. That’s very true Norene. This is why providing value is soooo important for anyone wanting to make a success of working online. Great post, as usual! You ladies have certainly motivated me this last few weeks. And no, I don’t spend hours purring over stats, thankfully. One issue I have which has been puzzling me constantly – good content is key, that I get and have been working on, but my question is – is the good content you write now basically used as guest posts which point back to your money pages? Is that the general idea? You’ve mentioned previously about the top 5 pages making the majority of your sales. Is it a question of building up links to these sites/pages? The ‘good content’ is used as content on our sites as well as for guest posts. So the general ideas is to start off by creating 5 well written product reviews. You don’t have to stop at 5 but you start at 5 and stick with them until they make money. There’s no point moving on to other reviews unless at least one of the first five is making money. At the same time you also need to write up some nice information type articles to add to your site that link back to your five product reviews. And for backlinking you create more information type articles to submit to sites as guest posts. What I see that is of “high value” on this blog is the time Paula and Wanda take to response to almost every comment to their posts. The high value here is relationship, which is always the best ranking, highest SEO keyword in IM, “relationship” with the public and people in particular. Thanks for showing us how it’s done! Creating a ‘relationship’ with your readers is very important especially for this type of blog. It becomes a word of mouth thing really. I know that traffic steadily increases on this blog and we do nothing to promote it so it must work. My main site started out of passion and it’s grown to a good full time ecommerce business. Lots of rankings, traffic, and a community sharing ideas on the topic. This site has been very successful in that “stumbling, bumbling” sort of way. Now the trick for me is to expand on the success by being a bit more focused and diligent, without getting into paralysis by analysis. Well if it is working for you already Craig then you are doing everything right even if as you say you have been ‘stumbling and bumbling’ your way through it all. Because you already have a following and traffic you can really capitalize on that. You might want to take a look at this post to see if it can help. I know you don’t have multiple sites but the concept still applies whereby you are making use of traffic you already have. Also, for your site to further increase your income you might want to think about having a ‘Best of the Best’ section where you review the best products in your niche eg. The Best Fencing Shoes, The Best Foil and so on. And you can even niche it down further eg. The Best Fencing Shoes for Beginners, The Best Fencing Shoes for Advanced Fencers. Those “Best of” articles would do well for our ecommerce store as those tend to be the top questions asked by beginners in our forums – which drives the experienced members crazy! I read through that other post and there are a few things I can do there. I have to really dig through analytics on the pages that I’m building to be the product sales engines. For a large, already active site this is a balancing act – too many product reviews for products related to my niche and my existing readership will get upset. I’ve read through some tips on that as well, so may be implementing these as pages rather than posts for future reviews. All valid points. I think all things need to be done to make things turn out good. Over thinking, planning, monitoring, and over duing can all be harmful. To much researching and you will never start going cause you are going to learn new things to do all the time. I did some research when I started things, then found out other things as I was going and implimented them as I went. It is a big business and there is a lot to learn. Research some, start, analyze, plan, and enhance. Rinse and Repeat. It’s never ending learning with this business. I think that’s what a lot of newbies fail to realize and they get frustrated wondering why they don’t make money in the first few weeks. It’s a business like anything else and you have to start at the bottom if you want to make it to the top. I glad to read your article. Now I understand that passion makes a winner. Passion makes good valued content too. I must say that, this has made your blogging so successful. However, things that you think less (SEO, Analysis, Ranking, Keywords) are still useful to me. This would include networking and socializing. I still found difficulties, and that is the reason I am reading your article. There are a lot of posts on this blog that will help you. Just go to the archives in the sidebar and start reading… and we”ll keep adding more. Unfortunately as people get their sites over optimized Google did very much the same thing with their algorithm. According to my experience, good honest content, and putting a value before anything is not enough anymore. I see some spammy sites doing pretty much well these days. At least, top 10 had to follow some basic rules, not it’s all a gable. What I do give you credits for is that I really did found this blog by organic search only. I tend to agree with you Johny. Google keep saying that they want to improve their search results and for a while there I thought they were. But I have seen too many websites (including our own) beat out by spammy sites after their latest updates. It’s just not working. hi Paula, nice info i think it’s time to go ahead not more thinking I spent so much time last year thinking about ‘doing’ versious things, thinking doesn’t make me money. Thinking gets in the way most of the time. Sometimes we just have to bite the bullet and go for it, even if it may result in failure. It’s the only way we can move forward.